An imperious race invades the Federation! For GURPS Prime Directive! The most dangerous enemy faced by the Federation is the Klingon Empire, and yet the Klingons don't regard the Federation as their primary threat! There is much more to them. * History of the Klingons: How Kahless conquered the planet, the Old Kings who took the Klingons into space, then stranded them back on their homeworld. How the Klingons returned to the stars and conquered a mighty empire! 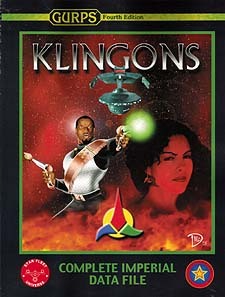 * Complete Racial Profile: Everything there is to know about the Klingons! Biology, culture, military, government, emperors, religions, economics, legal system, Imperial Paladins, military nobility, intelligence agencies, Secret Police, and more! * Planet Survey: Complete data on 23 Star Systems and over 100 planets. Klinshai, warrior colonies, subject races, industrial worlds, more! * Starships: Complete Space 3rd Edition data files for more than 100 types, classes, and special mission variants ranging from the mighty B10 battleship to the tiny G2 police corvette. * Technology Files: Disruptors, agonizers, two-handed swords, six different daggers, complete deck plans for the G1 fast patrol ship, medals, rank insignia, and the dangerous but effective Mindsifter! * Adventure! Make a deal on Verlix Station, or risk your career on Lieutenant Thirek's experiment.